The company investment is opening the line producing geosynthetics: polyester geogrids to the reinforcement of bituminous layers. Full offer of polyester geogrids was introduced into the market under the name of CERTUS G and CERTUS A. High quality of the products is proved by the results of tests held in accredited laboratories in e.g. TBU-GmbH Institut für Bau und Umwelttechnik in Greven Germany. This offer is particularly addressed to road companies, design offices and investors operating in road engineering area. Company offers services in project-consulting field. Moreover the company offers wide access to the latest and the best solutions based on geosynthetics for both designers and investors. They offers wide access to technical information, consultancy and help with creating proper documentation. The company co-operates with professionals, experienced engineers. It also has a designing software at its disposal and offers full help with solving problems appearing while designing and choosing geosynthetics. 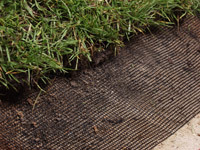 Polyester geogrids are used to enhance, stabilize and reinforce subsoil. They are made of highly resistant polyester fibres. Both the production technology (grids are produced by using modern knitting technology) and used materials, guarantee high quality of geogrids and years-lasting durability of technical parameters. 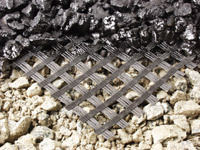 In order to increase geogrids’ durability, their resistance to chemical, natural substances found in subsoil, and substances which are side effect of human activities, like acid rains, fertilizers, chemical compounds coming from cars’ exhaust gases, geogrids are coated with layer of thermoplastic polyvinyl chloride (PVC). Polyester geogrids are produced in shape of flat structure, which is a result of knitting on knitting machine. Open mesh structure enables double-sided penetrating of soil. Usage of aggregates of proper granulation causes blocking of the soil in meshes, which limits horizontal movement of the aggregate. This leads to better load placing in foundation, which means smaller deformation of subsoil, under the traffic pressure. Firmer subsoil does not react to linear wheel pressure and ruts are smaller – this enables the possibility of a bigger pressure on the surface. Polyester geogrid adjusts to local subsoil deformations and smoothly cooperates with the soil and aggregates for a long time. Polyester geogrids are not sensitive to temperature changes that is why they can be placed in different weather conditions. Great flexibility enables to place them easily on rough subsoil in different shapes. The grid is easily cut by the sharp knife of proper size. 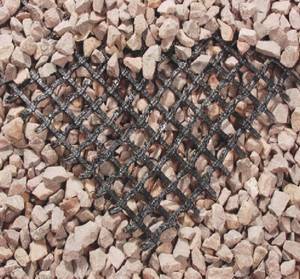 Construction design is the base of any road works using polyester geogrids. Depending on particular geological conditions and expected technical parameters of ground construction the designer selects proper types of grids, valuing their resistance to stretching and lengthening at maximum overloading and mesh size. The building project should define the technology of preparing the subsoil to the grid as well as placing and covering the net. The building project of each road investment should be made by people who have appropriate qualifications. Polyester geogrids are folded by the producer in black, waterproof, polythene foil. The foil has to secure the grid against damaging during the transport to client and while being stored. The foil protects the grid against UV rays. Geogrids rolls are winded on the paper sleeves. grids without foil should be used in a week time otherwise they should be wrapped in foil once again. During the transport the grids should lie in one layer so as not to move. Each roll has producer’s label containing basic information about the product. These labels should be saved in case any complaints. The use of Geosynthetics opened a new era in civil engineering – their unique parameters completely changed the construction process making it easier, faster, more reliable and cheaper. GeoGrids with integrated nodes have vast number of applications, however they can be generally put into two groups: slope stabilization and soil reinforcement. Their remarkable characteristics result in their extensive use by the construction sector. As effective slope and soil stabilization products Geogrids with integrated nodes created new possibilities for civil engineering. They are applied in the growing number of diverse structures, such as highways, embankments, barriers, railways, landfills and many more. Every road, highway should be as durable as possible. However, quite often the costs of proper soil stabilization are extremely high and the process itself is very time-consuming. GeoGrids with integrated nodes are perfect for soil reinforcement under every newly constructed road. They ensure even distribution of load forces thus improving the construction’s durability and solidity. Moreover, GeoGrids shorten the construction time and minimize the resources spent on reinforcing the soil, lowering the construction costs as a result. The construction sector is in constant search for new products that minimize the costs and improve the construction time of a given structure. Geosynthetics as slope stabilization products can be applied in various situations to boost the parameters of any structure type. GeoGrids with integrated nodes proved to be ideal solution for fast and reliable reinforcement of embankments. They enhance every structure’s solidity, stabilize the soil and make them much more reliable, improving people’s safety as a result. The railway structures demand the implementation of solutions that ensure their highest durability. The forces that work in such structures are tremendous, and it is extremely important to use the best materials and products in the construction process. 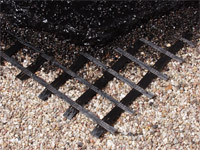 GeoGrids with integrated nodes can be applied in railway structures to reinforce the soil and boost their reliability and solidity. Similarly to road structures they secure even distribution of load forces and considerably reduce the resources needed for such constructions. The construction of barriers and embankments requires the application of materials and products which parameters will meet the high demands of such structures. GeoGrids with integrated nodes not only secure the best stabilization and reinforcement, but also limit the time and resources spent during the construction phase. Therefore, their application is cost-reducing as well as highly effective. As a result, GeoGrids with integrated nodes are exceedingly used in civil engineering, including the construction of embankments and barriers. One of the most important elements of any structures are their foundations. The soil underneath it should be properly reinforced to bear the load of the whole construction. GeoGrids with integrated nodes offer the demanded parameters for any structure type, increasing the capacity and accelerating the consolidation of the ground. The foundations reinforced by the GeoGrids are secure, solid and durable. At the same time the material consumption is much lower as well as the time of the construction is considerably shorter. Even soil settlement and stabilization of embankments at landfills. At landfills the embankment stabilization as well as even soil settlement is of extreme importance. The characteristics of such structures demand the use of solutions that can be easily applied and at the same time are exceptionally effective. Geosynthetics are just the right products for landfills – the correct application of GeoGrids with integrated nodes ensures the proper distribution of load force and the reinforcement of embankments. Their parameters make it a perfect solution for landfills’ structures.